When a director like James Marsh recruits veteran actors like Michael Caine, Jim Broadbent, Ray Winstone, Michael Gambon and Tom Courtenay for an infamous crime-caper, it raises viewer’s expectations. 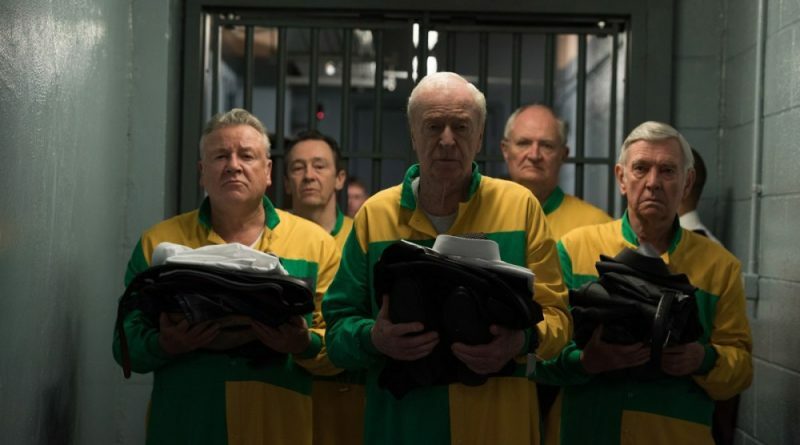 But hopes are dashed early on as the elderly, often ailing Cockney burglars quibble and complain to one another as they prepare to brazenly burglarize the Hatton Garden Safe Deposit in downtown London in 2015 over Easter weekend. That heavily fortified vault was used by top diamond dealers and jewelers to store their most valuable merchandise. Estimates put the thieves’ haul at about $250 million. 85 year-old Michael Caine plays recently widowed Brian Reader, who promised his late wife Lynne (Francesca Annis) that he would stay out of trouble. Burt the only time his juices really flow is when he’s planning a heist. So when Basil (Charlie Cox), a young security/electronics expert, appears at Lynne’s funeral, mild-mannered Brian swings back into action, presenting Basil’s idea to his retired criminal cronies: Terry Perkins (Jim Broadbent), John “Kenny” Collins (Tom Courtenay) and Daniel Jones (Ray Winstone) – with Billy the Fish (Michael Gambon), charged with fencing the loot. Problem is: these thieving, double-crossing codgers suffer from incontinence, diabetes, and hearing loss, among other debilitating ailments. Working from a tedious, docudrama-like script by Joe Penhall (“Mindhunter”), Oscar-winning director Marsh (“Man on Wire”) includes clips from cast members in their prolific prime – Caine in “The Italian Job,” Courtenay in “Billy Liar,” Winstone in “Scum” – and alludes to Ealing Studios’classic “The Lavender Hill Mob” (1951), which chronicled a similar story so much better. And it’s already been done: “Hatton Garden: The Heist” (2016) and “The Hatton Garden Job” (2017). Plus, a TV miniseries starring Timothy Spall scheduled later this year. On the Granger Movie Gauge of 1 to 10, “King of Thieves” is an uneven, forgettable 4 – in some theaters and VOD.